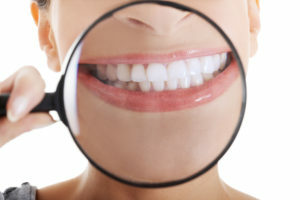 One problem that’s making a big impact on your appearance is your teeth staining. Of the new people you meet, one-third of them will notice your smile before anything else. Thus, the condition of your teeth could factor into how successful you could be at a job interview or with making new friends. Because of this flaw, you’re hesitant to smile and have trouble speaking with confidence when amongst a group of people. Thankfully, there’s a way to turn things around with Zoom teeth whitening in Winthrop. As you read on, your local cosmetic dentist weighs in to explain how the process of rejuvenating your smile works. The first step in the Zoom! whitening method is to visit your local dentist for a consultation. While there, the professional will assess the condition of your teeth and discuss your oral hygiene and lifestyle habits with you. Your dentist will also check for signs of previous dental work. All of these steps are taken to ensure that you have the most productive and safest experience possible. The Zoom! whitening method involves the use of high-powered bleaching agents made from hydrogen peroxide to lift stubborn stains from your teeth. The procedure takes about an hour to complete and consists of three 15-minute rounds of treatment. Each application consists of the dental technician applying the whitening gel and then a special light that penetrates the stains by activating the bleaches. While this process is taking place, you’ll be able to relax comfortably. After the last treatment finishes, the technician will immediately apply a sensitivity-reducing gel to your teeth. Another way to protect your new smile is to practice consistent oral hygiene, which should at least include brushing and flossing your teeth two times a day. The average cost of Zoom! whitening is $500, but that can vary slightly. This price includes the supplemental take-home trays that are provided. Having the smile of your dreams and gaining more confidence are well within your grasp. With the help of your cosmetic dentist in Winthrop, you’ll be able to accomplish both goals and much more. To schedule a consultation, reach out to your dentist today. Dr. Howard D. Brooks earned his dental degree from Boston University School of Graduate Dentistry and has gone on to provide expert care for the past three decades. To stay abreast of the complex changes in the world of dentistry, he pursues continuing education courses annually. From his state-of-the-art facility at Brooks Dental, Dr. Brooks helps patients get the smile of their dreams with Zoom! whitening. He can be reached for more information through his website.